Making the most of your marketing plan means understanding why consumers buy, paying attention to consumer marketing trends, and influencing consumers’ decisions. Segmenting the market helps you create messages that target your specific customers. Your marketing approach, personal influence, and social conditions influence consumers and what they decide to buy. 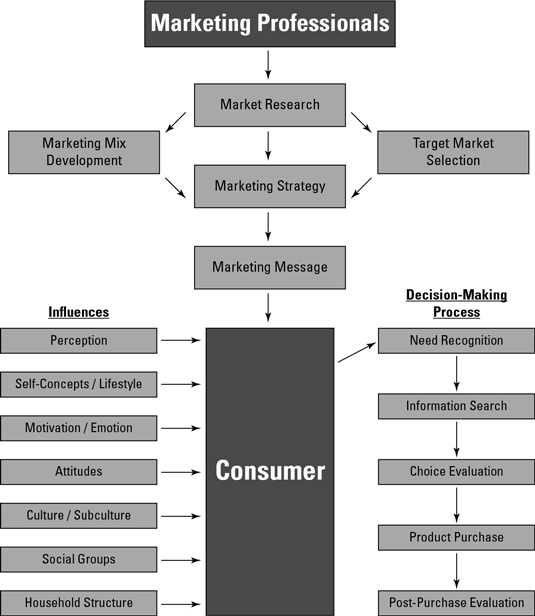 This chart summarizes the relationship between consumers, their buying behavior, and your marketing plan. Determine whether your core market qualifies for segmentation. Identify your core market for potential success. Identify submarkets within your core market. Identify the consumer behavior of each market segment. Estimate the size of your market segments. Phase 1: Recognition and Awareness of a Need. In this phase, it’s your job to position your product or service as a solution to a problem or need that a consumer may be encountering. Phase 2: Search for Information. In this phase, you must make sure that your information is available to potential consumers. If they watch television, you need to produce a few commercials. If they often use the Internet, you want to make sure you have a Web site and are participating in search-engine marketing. Make yourself available where your potential customers go to find information about your products or services. Phase 3: Evaluating the Alternatives. Provide information about your product in a way that’s easy to understand and that explains why you’re better than the competition. In other words, make sure it’s easy for consumers to understand why they should buy from you. Phase 4: Purchase. Make your products available to consumers or they’ll go somewhere else to make a purchase. Also be sure to make the purchase process easy and enjoyable for the consumer. Phase 5: Post-Purchase Evaluation. Service, Service, Service! Sure you need to provide your consumers with service before the purchase, but did you know that you also need to provide service after the purchase? Extraordinary customer care after the fact can help diminish feelings of buyer’s remorse or regret.